Aloha! Are you looking for a caterer for your next event? Whether you are planning a wedding, business engagement, birthday party, anniversary, or social affair, our friendly staff at L & L Hawaiian Barbecue will help guide you every step of the way through the challenges of catering a memorable occasion. L & L Hawaiian Barbecue serves a delicious fusion of Asian and American cuisine at reasonable prices. We can supply you with your needs from party packs to full-service catering for parties of all sizes. L & L Hawaiian Barbecue offers a fresh alternative to your catering needs with our award-winning food. Many of our unique signature selections are available for catering such as our local Hawaii favorite chicken katsu (breaded and deep-fried chicken served with our katsu sauce), our traditional Hawaiian kalua pork (smoky-flavored shredded pork with cabbage), our delectable BBQ short ribs (grilled short ribs marinated in our barbecue sauce), and our delicious side dishes such as macaroni salad and white rice. Our dishes are prepared and flavored with a unique, tasty island flare. Think about L & L Hawaiian Barbecue for your next catering event. Our prices are great for the value. We will bring Hawaii and the ‘Aloha’ spirit to your gathering. The food will be delicious and plentiful and your guests will walk away feeling satisfied. Please inquire about our catering services. Delivery possible within the city limits of San Francisco. Orders above $200.00 in value include FREE delivery. Last minute catering orders are possible ... please inquire with San Francisco L&L Management. Online catering service is under development ... please return at a later date for this service. 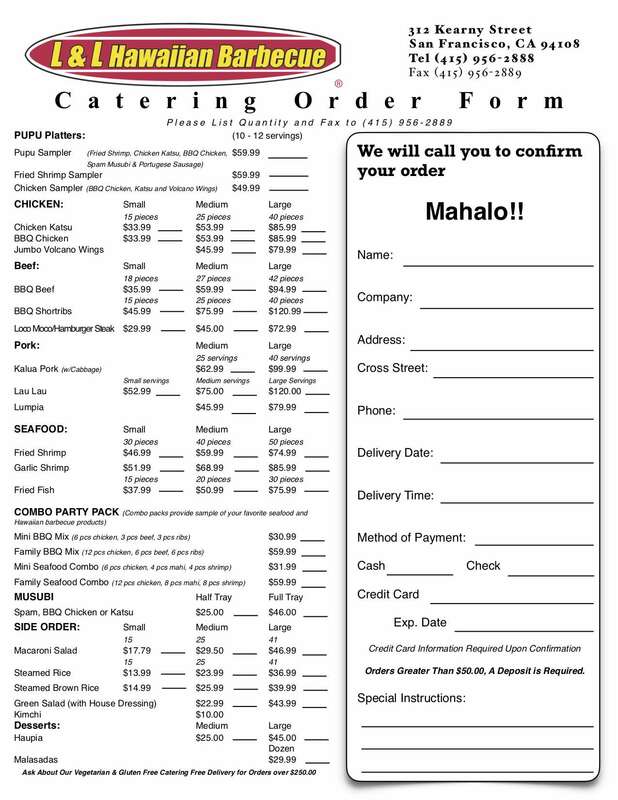 Click image to download pdf file of catering order.